I had meant to write something substantive on the politics-of-not-playing-politics evident in all aspects of the Christchurch earthquake and its aftermath, but circumstances have conspired to prevent me from doing so. I also have two deadlines in the coming week. So just a quickie, via George Darroch: What climate activists need to learn from the NRA and the gun-control wars. I’ve made the argument before that climate change, having as it does the weight of scientific orthodoxy behind it, should be an easy win in the battle of ideas. 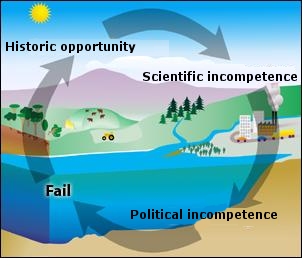 That it isn’t, I believe, is due less to the powerful business cartels and their conspiratist minions arrayed against it, and more down to poor strategy and coordination on the part of those responsible for ensuring that the findings of the science are adequately promulgated throughout society, and for ensuring the policy responses to the problem are appropriate. As gun control advocate Robert Walker argues in the linked post, those people — both the scientists and the political actors — can learn an awful lot from the NRA. Despite being pretty far out on the lunatic fringes even in the US political context, the NRA has simply phenomenal support both among gun users and those for whom the specifics of the debate have no direct relevance. They have this degree of support largely because they have succeeded in propagandising that issue to the point where its symbolic aspects matter more than its functional, material aspects. Doing this — breaking your topic from being a policy matter to being a symbolic matter in the public consciousness — is hard and complicated work, and you have to fight as if you mean to win; to not underestimate your enemy or permit your campaign to be hijacked by incompetence and vainglory. But if the NRA can do it with an issue like gun ownership, arguing for which on rational policy bases is deeply problematic, then surely those responsible for climate science can do as much. How they might do so is sketched in Walker’s article. How well did the media do on the Napier siege? Ethical Martini asked the question on Sunday. Out of largely professional interest I watched, read and listened to the coverage on the two main TV newses, National Radio, Stuff, the Herald online and their various dead-tree editions from Thursday to Monday so perhaps I’m too close to it, but I’ve been pondering the question since, unsure how to answer because it comes down to one’s assumptions about what the media is supposed to do in such a case. That’s a tricky question. If it’s supposed to maximise value for its shareholders, then it sure as hell did that, with garish wall-to-wall coverage and plenty of breathless speculation, really hitting the spectacle out of the park in such a way as to ensure that the name of Jan Molenaar will long be remembered as shorthand for `paranoid survivalist with guns, dope and death-wish’; our own little Ruby Ridge (but without all that annoying moral/ethical/legal equivocation). If it’s supposed to perform a civil defence or public order function, keeping those in immediate need of information informed for the purpose of ensuring their safety, security, peace of mind, etc, then I would have thought they did a pretty decent job – from Wellington, I thought I had a pretty clear picture of what was going on, despite not ever having been to the place in question or in such a situation. Comments from those in the local area, however, are mixed on this count – and those who know Napier express some frustration at the constant mangling of street names, landmarks, etc. If it’s supposed to be keeping the wider public informed on a matter of national significance, then I think the media did an exceptional job of keeping everyone engaged and updated with massive amounts of information, although with the proviso that much of that information was speculative at best. If it’s supposed to act as a communication medium from authority to gunman in the sense of megaphone diplomacy, then I think it failed miserably. Although this was largely down to police command not using it in such a way, the media also framed coverage of Molenaar in the third person and spoke to his family members in othering ways, hardly making it possible to reach out to him. I think the first broadcast message I heard which addressed him directly was on Friday night. If it’s supposed to act as a balm for a shocked nation, then I think it did a pretty good job of that as well, bolstering public confidence in the Police by portraying them as calm and disciplined rather than vengeful and reactive, and local businesses, charities, schools, Civil Defence and local government as united in solidarity, working well together for the public good, as we might hope they would in what I hope it isn’t too churlish to term `a proper emergency’. If it’s supposed to tell us who to cheer for and who to boo at, once again it did a cracking job. You know you’re dealing with a real villain when all the people who can’t go home for their own safety are classified as `victims’ and even the people who make cups of tea for them are `heroes’. If it’s supposed to stimulate and inform public debate on the wider political and social issues which are germane to the case – drug law, gun law, alienation, the role of the coercive arm of the state in private affairs, police doctrine and posture, the complexities of entrenched tactical operations – then it gets a bit more complicated. On the one hand, I’m inclined to think it did an execrable job. If I may cram a whole lot of mixed metaphors in here: the lobby groups, armchair experts and those with an axe to grind on such matters have played the media like a fiddle, and the media has tuned itself up and rosined the bow to allow it. We’re going to get an awful lot of heat and precious little light. Instantly we have people calling for more guns, less guns, more guns but only for some people, guns to be licensed like cars rather than owners being licensed, the absurd notion I heard on NatRad this morning that all privately-owned firearms should be stored at a central, secure facility and be checked out and back in again. The battle of the slogans is well underway – `if you’ve nothing to hide you’ve nothing to fear’ counterposed against `when you outlaw guns, only the outlaws have guns’, for a start. And then there’s the debate about marijuana, with the frankly idiotic counterfactual that if the police didn’t prosecute minor drug crime then they wouldn’t have been in this sorry mess at all – possibly true, but only until something else brought the red mist down on Jan Molenaar. On the other hand, the free flow of information around this case – the fact that every idiot on Your Views and talkback radio gets to listen to the so-called experts and decide what to think – should mean in principle that we have the basis for a good fact-based debate. Is not free expression via the media, with everyone putting their arguments up to be judged in a market of information, the most efficient means of determining which views have merit and which are bogus? If not, by what other means should we determine the relative merits of conflicting views and arguments? I’m still no closer to an overall answer to the question Martin posed. I think it’s pollyanna-ish to say that the coverage did what it needed to do because everyone got a say, we all got our little reality TV fix and all the experts got a chance to climb up on their hind legs and argue the world to rights, but I think it’s curmudgeonly to decry the whole affair as a lurid farce.